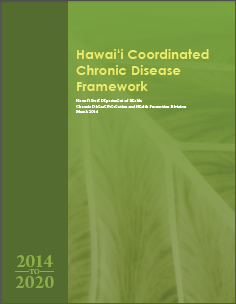 CDPHPD collaborates with partners to host events and other media opportunities that bring attention to Hawaii’s obesity and chronic disease epidemic. In June 2012, HHI held a symposium titled “Weight of Hawaii: The Need for Obesity Prevention and Policy”. This event brought together over 100 obesity experts, elected officials, businesses and community stakeholders, and highlight potential policy changes that would address the obesity epidemic in Hawaii. National experts from the Institute of Medicine presented key recommendations from their groundbreaking report, titled Accelerating Progress in Obesity Prevention: Solving the Weight of the Nation, and a local expert panel discussed the importance of addressing obesity in Hawaii. Speakers included Governor Neil Abercrombie and University of Hawaii President MRC Greenwood. The event also served as the launch of the Childhood Obesity Prevention Taskforce created per Act 269 (PDF), which passed in the 2012 legislative session. The symposium was captured in the16-page insert “Weight of the State” (PDF), in Honolulu Magazine (Sept. 2012) and Hawaii Business magazine (Oct. 2012). 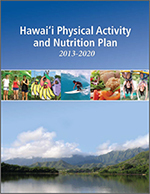 Besides providing an overview of the symposium and the recommendations that came out of it, the insert contains examples of model programs across Hawaii by various organizations which address obesity in schools, worksites, communities and health care settings. The insert represents the work and collaboration of many organizations throughout our state that have a stake in health (see last page of insert of complete list of contributing partners). In November 2015, a second symposium was held in which national experts identified best practices and policy recommendations not only to address the growing obesity epidemic, but also chronic disease. Three in every five Hawaii adults are living with at least one chronic disease or condition like diabetes, heart disease or cancer. Over 100 elected officials, heads of state agencies, healthcare organizations, and community partners attended the symposium. Dr. Howard Koh, former Assistant Secretary for the U.S. Department of Health and Human Services, gave the keynote address, explaining the increase in obesity rates and the corresponding risk for chronic health conditions. A panel presentation with Koh and other national experts identified policy solutions for Hawaii, based on the recommendations presented. These included 19 policy recommendations that were developed by over 140 community partners who attended the 2015 Physical Activity and Nutrition Forum, which took place in May of this year. 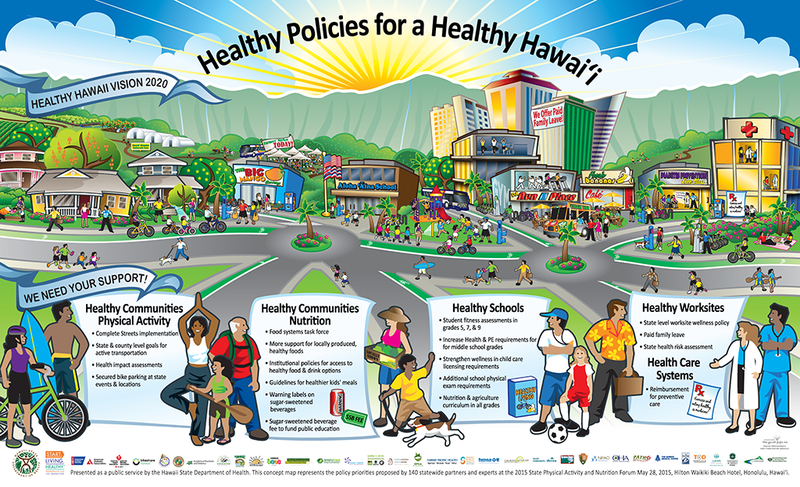 These 19 Policy Priorities from the 2015 Physical Activity and Nutrition Forum were depicted in a mural: “Healthy Policies for a Healthy Hawaii” (shown below), which was unveiled at the symposium.